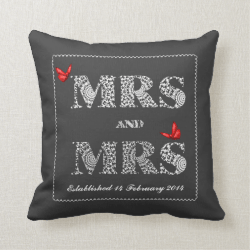 A special wedding gift on a special day for the happy lesbian couple this white lace effect word art poster print " MRS and MRS" with red butterflies on a dark grey background. Don't forget to personalize it with the date of the wedding for that extra special touch to make it a keepsake of the date they established their marriage. 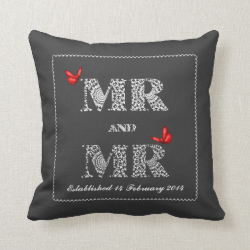 A special wedding gift on a special day for the happy gay couple this white lace effect word art poster print " MR and MR" with red butterflies on a dark grey background. Don't forget to personalize it with the date of the wedding for that extra special touch to make it a keepsake of the date they established their marriage. 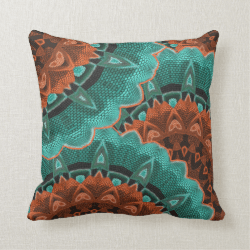 A beautiful big flowery pattern in teal blue, orange and brown; a real luxury look home decor throw pillow. 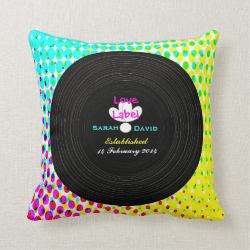 A special vinyl record retro music themed funky throw pillow wedding gift on a special day for the happy couple. Don't forget to personalize it with the date of the wedding and names for that extra special touch to make it a keepsake of the date they established their marriage. 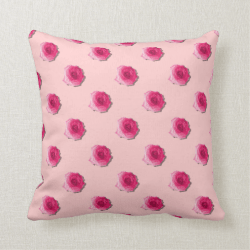 A fantastic throw pillow with beautiful pink dewy roses in a repeat pattern design. so pretty. 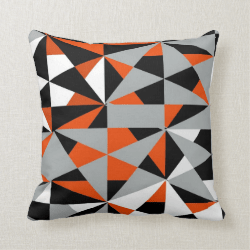 A fantastic throw pillow retro inspired modern art pattern with geometric triangular shapes in shades of orange, grey, black and white. A really funky cool look for any room. 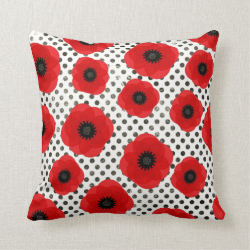 Big bold and bright , red poppy flowers on a faded black and white polka dot spotted background. A lovely fresh bright look for any type of room. 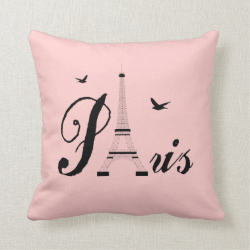 The Eiffel Tower, Paris black word Art trendy picture on a girly pink background give these pillows a really great look. Simple but effective they will enhance any type of room be it a bedroom or living area. 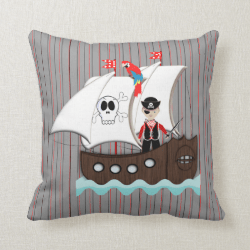 Such a cute kids throw pillow with a fun pirate theme, the kids will love the pirate ship with a little pirate and parrot on board and of course the skull and cross bones emblem. Fantastic for a pirate themed bedroom and a real favorite with the boys. 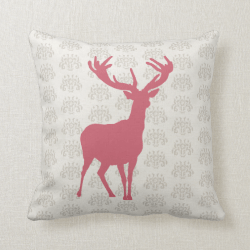 This Pink & White Stag Picture Cushion Pillow has a great fresh modern look and will bring a touch of style to any room. 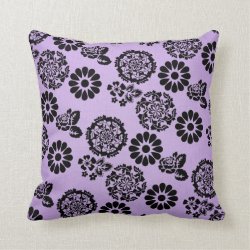 So Pretty Black Lacy Flowers with Lilac/Purple background on throw Pillow Cushions. 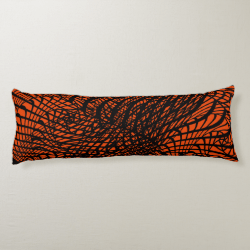 These will look striking in any type of room whether its a bedroom or living area. 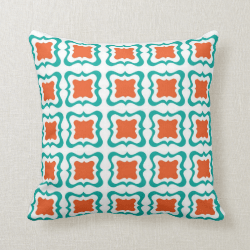 A fabulous design so on trend with a square repeat pattern in lovely fresh shades of teal blue, orange and white, a modern throw pillow which will look great in any room. 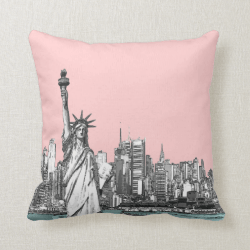 A modern design depicting the Statue of Liberty in New York in a sketched effect on a pink throw pillow. Want a different color, no problem just click on customize and edit background where you will find a choice of other colors at no extra cost. 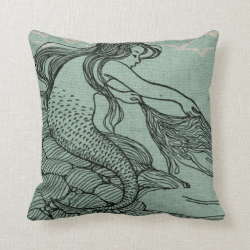 A beautiful young mythical mermaid on the sea shore a fabulously dreamy picture in a shade of aqua blue. 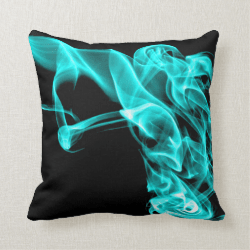 This Turquoise Black Modern Design Pillow Cushion is really striking and will give a stylish look to any area. 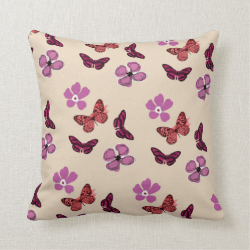 So Pretty in Pink, Purple & Red; Butterflies & Flowers on throw Pillow Cushions. These will bring a touch of summer into any type of room whether its a bedroom or living area. 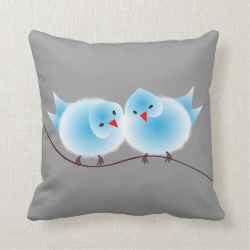 Such a cute picture of two whimsical blue love birds, so sweet. 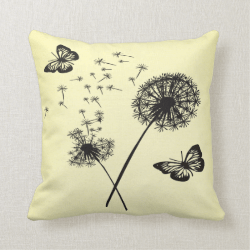 Yellow & Black Pillow Cushions with Butterflies & Dandelion Wishes are so pretty and stylish they will enhance any room.. 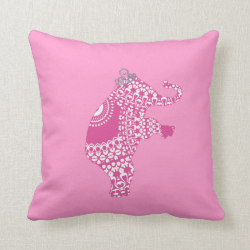 Girl's Pink Princess Cute Elephant American MoJo Pillow This is so beautiful with a cute pink princess elephant in a gorgeous pattern, any girl will be thrilled with it. Will look awesome in your babies Nursery or child's bedroom. Why not customise it with the child's name. 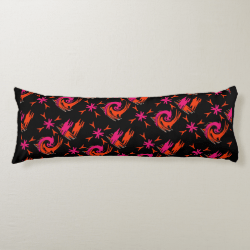 A fun funky bold black, pink and orange firework inspired abstract fabric print. Fabulous home accessories. 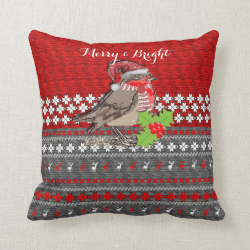 A fabulous holiday throw Pillow in a mock Scandinavian style Christmas Knit pattern and a cute little robin in his Santa Hat. 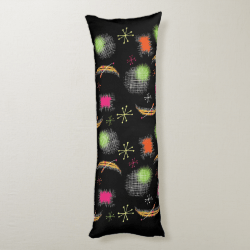 A Lovely festive merry and bright home decor accessory to give as a gift or keep for your self. 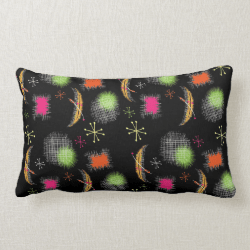 A modern on trend look inspired by vintage retro atomic sphere style abstract patterns. A stylish home accessory in colorful tones of orange, green, yellow, pink, black and white. 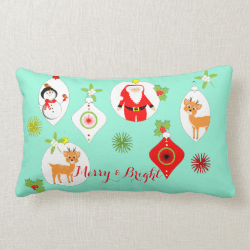 A fabulous Christmas holiday Lumbar Pillow with retro style festive baubles, little cartoon reindeer, Santa and a snowman, so cute. 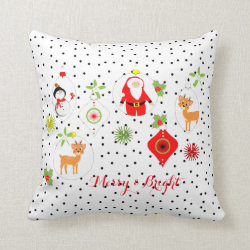 A fabulous Christmas holiday throw Pillow with retro style festive baubles, little cartoon reindeer, Santa and a snowman, so cute. 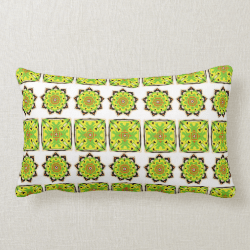 Very stylish modern repeat pattern fabric print in shades of green, yellow and beige, fabulous home accessories. Inspired by all those vintage Christmas Jumpers with such pretty patterns I have designed this image in a knitted effect with Stag Reindeer in pink white and grey. 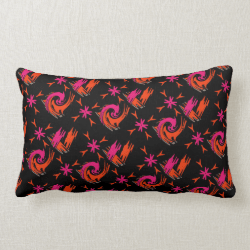 Looks fantastic on these quality throw pillows, a great trendy look for any room.